Here’s my theory behind the creation of Disney’s new direct-to-video (DTV) sequel, The Hunchback of Notre Dame II. 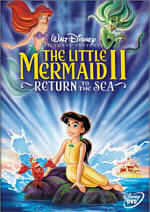 Some Disney executive spent the last six years unhappy because of the way the 1996 original concluded. “Why can’t Quasimodo get the girl?” And now we have II, a flick that seems to exist solely to right that potential wrong. 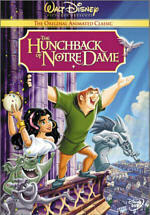 The Hunchback of Notre Dame II appears in an aspect ratio of approximately 1.66:1 on this single-sided, double-layered DVD; the image has been enhanced for 16X9 televisions. Note that I grade picture quality, not transfer quality. While the DVD seemed to replicate the original material well, the many problems that occurred due to the cheap animation meant that the movie never presented a very vivid impression. Actually, I gave “B” grades to both Hunchback II and the original, but don’t construe that to mean they looked the same. Hunchback usually looked terrific, but it lost points due to excessive print flaws. II, on the other hand, showed no such concerns. The movie always seemed clean and fresh, as I detected no signs of speckles, grit, grain or other issues. Sharpness was usually positive. A few scenes came across as soft and muddy, but invariably those concerns appeared to relate to the original art. The problems only affected wide shots, and they remained reasonably modest across the board. I saw no evidence of jagged edges, moiré effects or edge enhancement. Colors seemed heavy and problematic at times. Again, this primarily resulted from the cheap production values. Hues looked badly “off” on occasion. I already noted the inconsistency with which Hugo was tinted, but I also saw that colors generally looked too thick. Shin tones tended to absorb the background values, so they became pink or purple depending on the setting. Black levels seemed acceptably deep and rich, while shadow detail looked appropriately dense without too much darkness. 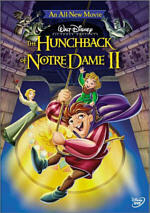 Compared to the original film, Hunchback II featured bland and lifeless art, and the DVD replicated that fact. While the quality of the art and animation dipped severely between Hunchback and II, the sound actually improved slightly. The DVD includes both Dolby Digital 5.1 and DTS 5.1 mixes, both of which seemed identical. I noticed virtually no differences between the two tracks. For the most part, the two movies seemed rather similar. The soundfield of II mainly stayed with a bias toward the front speakers. Within that spectrum, music displayed very good stereo imaging and presence, while effects also offered strong delineation and movement. The front realm gave us a clear and well-blended environment in which elements panned smoothly. Audio quality presented the most noticeable improvements over the original film. Dialogue came across as reasonably natural and distinct, and I heard no problems related to edginess or intelligibility. Music appeared clear and bright and the songs showed nice depth. Effects were clean and accurate, as they displayed no distortion. Those elements sounded lively and vivid. As I noted, II’s soundtrack really seemed very similar to that of Hunchback, but it displayed better bass response, so I upgraded my rating slightly to give the sequel a “B+”. While the first film’s DVD doesn’t pack a ton of extras, it definitely outdoes the sparse collection found on II. Behind the Scenes With Jennifer Love Hewitt offers a very glossy four-minute and 45-second featurette. Hosted by some kids from the Disney Channel’s Movie Surfers show, the program offers some brief and uninformative comments from Hewitt and then shows her in the studio as she records one of the movie’s crummy songs. Blech! Next we discover A Gargoyle’s Life: It’s Not Easy Being a Gargoyle. This gives us a two-minute and 40-second clip in which Jason Alexander reads a lame poem about the life of a gargoyle. Skip it. When you start the DVD, you’ll find ads for some other Disney flicks. There’s a promo for the DVD video release of Beauty and the Beast. In addition, the DVD opens with promos for Tarzan and Jane, The Hunchback of Notre Dame, Max Keeble’s Big Move, and Disney DVD as a whole. These clips also can be found in the Sneak Peeks area alongside additional ads for The Many Adventures of Winnie the Pooh, Schoolhouse Rock, and American Legends. 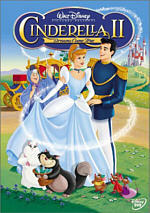 Perhaps someday I’ll see a Disney direct-to-video sequel that entertains me, but not today. The Hunchback of Notre Dame II seems like one of the worst of the bunch, as it provides a dull, insipid and bland piece of work. The DVD provides a transfer that accurately represents the original visual material, along with solid sound and some lame extras. Unless you’re desperate for more Quasi, avoid Hunchback II.